Mobility-as-a-Service (MaaS) offers easy and reliable access to vehicles, paying for the use by the minute. Vehicles can be reserved from any computer or, more importantly, from any smart phone. The phone itself, combined with the proper app, becomes a proxy for the individual, providing navigation, customization, payment, tracking, etc. With the phone in constant communication with itMoves' base, innovative ideas like demand-driven pricing (including free trips) can be implemented. The final goal is to get as close as possible to a self-balancing system that allows for affordable EV one-way trips, the Holy Grail demanded by current customers. Parking. As explained below, it is their biggest headache, both for pricing and logistical reasons. 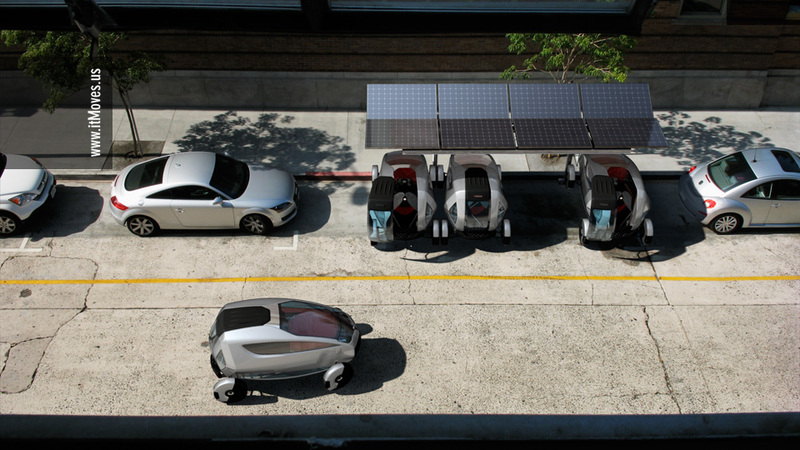 Our system allows four vehicles per parking spot, a dramatic improvement. Electronics. Cars today are complicated electronic islands, closed mostly for liability and reliability reasons. Adapting new vehicles to existing car-sharing fleets is another big headache. By developing ME from scratch, we can include a high amount of open source right from the start. Moreover, since the vehicle is not developed for the retail market and only with short trips in mind, a lot of modern conveniences are redundant. For example, a complicated radio unit can be replaced by a small amplifier, a few speakers and a USB smart phone dock, all available off-the-self. Small fleets. In order for a one way sharing to be economically viable, there is a certain critical mass that needs to be achieved. Expensive parking and expensive vehicles (specially when talking about EVs) mean a slow rate of organic growth, which further delays the introduction of one-way rentals (again, what lots of customer's demand). At itMoves, our goal was to saturate one market (Greater Los Angeles) with a vehicle+station combination that optimizes land use and will therefore allows us to reach critical mass as quickly as possible. For the final user, ME provides access to the cleanest vehicle on the market without the need to buy one. Unlike other economical EVs, ME is safe, spacious and attractive. Its innovative one seat layout allows for a better use of space as well as a lighter, safer structure. Connected to an intelligent, on-demand transportation network, ME allows the rider to access transit quickly any time of the day. For a low income family, that's a lot of money. For a car guy (or gal), that's the money for your weekend toy, and then everybody (you, the planet) wins. Although relatively small, car-sharing has been consistently growing at a 40% annual rate, with global user jumping from 350,000 to 945,000 in only three years (2006-09). Benefiting from network effects and word of mouth, car-sharing is expected to grow into a 4.4 million users, 72,000 vehicles market in the US alone by 2016. A major reason is the growing penetration into college campuses. As more students familiar with car-sharing end their studies, a significant portion is expected to continue to use the systems after graduation where available. Political will: The first public EV-sharing program, Autolib, was recently announced by the city of Paris and will launch in 2011 with 4,000 cars. We expect a number of cities around the globe to announce similar programs once the model is proven, in similar fashion to the widespread adoption of bicycle sharing programs after Paris introduced Velib’ in 2007. Asian market potential: Although slow to accept car-sharing so far, Asian cities fit the prototype for the ideal car-sharing market, with their high density, great transit systems and young educated populations. It goes without saying that China could became a major player. Large user pool: access to a large number of final users (approximately 48 per vehicle) dramatically expands the learning opportunities through pilot tests, surveys and automatic data collection. Fast product iterations: customer and final user feedback will guide development when feasible. Under a lease/fleet contract, improved vehicles can be deployed immediately while the old units are refurbished and returned to the system later on, with little disruption. A young, self selected audience: urban car-sharing members tend to be well-educated and socially and environmentally aware. Early adopters of car-sharing were typically in their 30s and 40s, with middle to upper middle incomes. Increasingly, there has been a significant growth in car-sharing among younger drivers as operators have expanded services to university campuses. Simplified marketing and sales channel: from a logistical and legal perspective, distribution is one of the main obstacles encountered by startups entering the electric vehicle space. By keeping the vehicles in-house, most if not all of those issues are avoided. Parking is the second biggest operational cost (and biggest headache) for car-sharing companies, with Manhattan costing up to $4,800 per car per year. Although some cities like Houston have gone as far as waiving meter fees (loosing up to $1,900/year) most parking spaces still have to be leased by the operator. As fleets increase, simply getting a parking spot is an issue, with residents sometimes resisting giving away public space to a for-profit when parking is scarce. Our solution allows four ME to fit into a standard US parking spot. 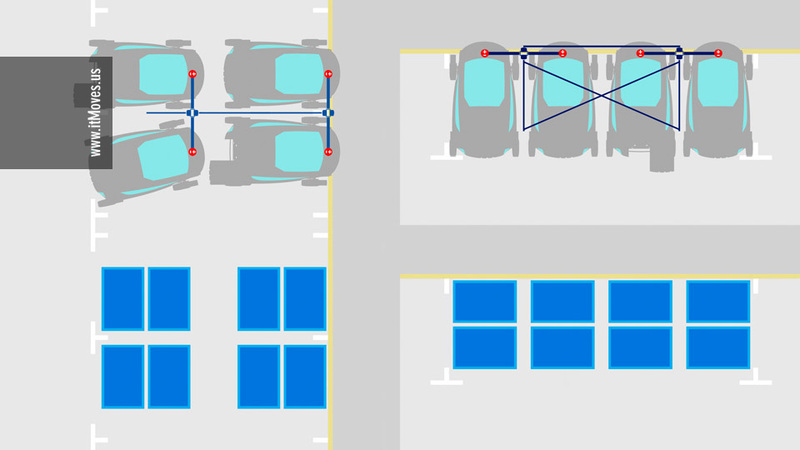 Four vehicles per parking spot allows to reach four times the amount of customers, or to reduce parking expenses by 75%. The solar panels keep the AC or heating running, for improved efficiency and a better user experience. Recognizable, clean, fun image could be a magnet for outdoor advertisement, with the capability of delivering up to $1,000 per car per year.